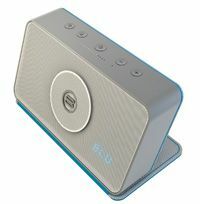 Bayan Audio adds £150 Bluetooth wireless speaker with built-in radio | What Hi-Fi? The latest Bluetooth speaker arrival is the Bayan Audio Soundbook, which sells for £150 and has a built-in FM radio. It combines Bluetooth 4.0 with aptX to give wide connectivity and enhanced performance, has NFC pairing by simply touching a suitable device, and TSMA noise-rejection to keep interference away from the music. Its battery gives up to 10 hours' use from a single charge, a multi voltage charger is supplied, the FM radio antenna is built into the flip-back cover/stand, and a microphone is also onboard to allow the Soundbook to be used as a speakerphone. It automatically switches to conference-call mode when a call comes through, switching back to playing music when the conversation is over. A 15W stereo amplifier drives two 25mm speakers with neodymium magnets, with bass provided by a 5cm passive driver, and there's a 3.5mm stereo line input and and output for headphones.